Previous Article One narrow drawer . . .
Oh this is lovely. And I do believe we are going back to cotton diapers due to the stress on our teeming landfills. I so enjoy the photo of the corn. Along with your wonderful haiku it is perfect for your write. You have shared some of this time in your life in Iowa with us. This is indeed a perfect snapshot of your time in Iowa, “a space to live simply on the land”. I like this immersion into nature. Yes. It was special. Sorry I have not replied to your question of cutting words in Haiku separating the two parts. It isn’t always a simple answer. But basically, you want a separation between contrasting ideas in the first line and the last. It is open separated with a small dash – an aspiration of breath in the Japanese and unwriteable. If you look at my haiku today you will see the difference in the first and last lines, separated by the short dash. Often if is a natural separation. Living in a small town, most folks have gardens, a few still have chickens. We only raise tomatoes now–eight plants a year, feasting on fresh tomatoes all summer. Your piece is very slice-of-life. Not many of us spent extended time on farms. You make it sound wonderful. Well….we weren’t farming. We rented out a good amount of the land for a hay field to a farmer who also used our 100+ year old barn for storage. But – we were the only house – hence people, for miles and had a humongous garden. George was born and raised right in the heart of Chicago and bought a small ride-on John Deere that he used to mow our huge lawn, plow our garden and plow snow from our long country driveway. He was n seventh heaven on that thing! It reminds me of farm life in northern Indiana when I was young. We’re so thankful we had this life experience. Oh oh oh. Little house on the prairie. I can feel the heat, and the weight of those beets. It just sounds so wonderful. We truly loved it there. I could go out on a hot summer day in my underwear to hang out sheets and only the farm cats were the wiser. I couldn’t convince my daughter in law to use cotton diapers. She insisted on disposable because she said it was easier. And, oh yes, air-dried bed linen is perfection. How long did you live on your farm? This piece has a sleepy drawl to it, warm and full of beauty. It was a calm restful place/pace of life. Iowa sounds and looks like a wonderfully spacious place, Lillian. Farms here are small in comparison. I love the way you describe the washing on the clothesline – there’s nothing like the smell of freshly washed laundry drying on a line. The garden is so fertile and full of fruit and veg – heavenly! I That’s a great link in your haibun, between the beribboned hills and the corn silk. Such a contrast to Boston, I should imagine. Nice in the moment write. Lovely photo. It truly was a special place. The house itself was moved when they built Interstate 80 across Iowa…picked up and plopped in the middle of cornfields. We though the cracks in walls gave it character…the first home we ever owned. Many happy days there….solitude by two and then our little ones. So reminiscent of my childhood years on a farm in middle Illinois, living the simple life. I have fond memories. You took us all to Iowa and a simpler time. Well done! Thank you. We absolutely treasure the memories of these special times and place. One fond memory I have is a visit to my father’s (I never knew him, he was KIA) family in Iowa. I was about 4, have photos of me shucking fresh-picked corn, taking a bath in an old tin tub on the back porch and visiting the Little Brown Church in the Dale. Delightful. Oh, Lillian, I LOVE this Iowa haibun!! 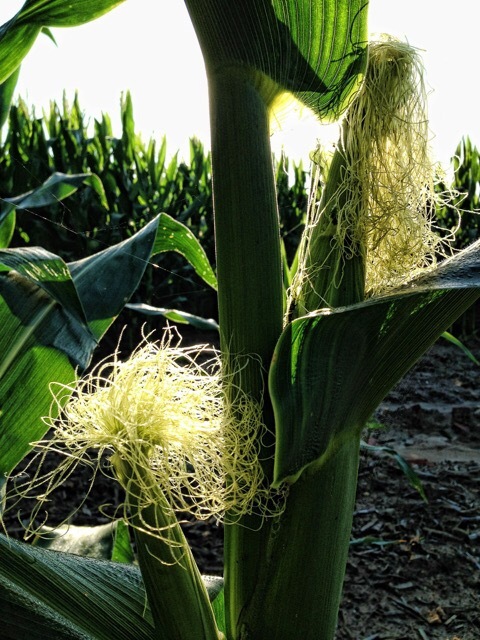 You’ve captured the beauty of our rural lifestyle…and included a fabulous photo of corn. I wish I had written this…but so glad YOU did! Need a LOVE button for this! I like how you have taken the prompt and shown that it’s not just the forests where we can bathe in the positive aspects of the natural world. Such a lovely, restorative place to live. I was right there in the scene, feeling the warm sun, listening to the peace. Beautiful. Nothing like the first taste of that tomato right off the vine, eaten like an apple with the juice dripping from your wrist! yaaaaaay! i didn’t notice that! 😀 😀 😀 thanks again, Lill!